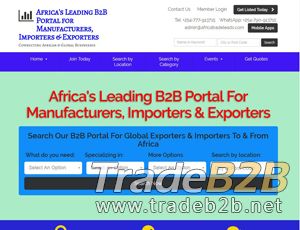 Africatradeleads.com - Finding Importers and Exporters into and out of Africa is easy with Africa Trade Leads B2B Portal. Search Africa Trade Leads to instantly connect with Top Importers & Exporters. For Manufacturers. About Africatradeleads.com - Africa's Import-Export Directory's recommend,only on behalf of the views and opinions about B2B Directory, if you have any suggestions , please feel free to contact with us, we will amend and correct them in the first time according your suggestions. More better B2B Websites recomend, Please click here.